There's no point in even introducing this new edition of Tuesday Game Room. It's over. Video games will never be better than this. Still, join us, won't you? I finished Infamous: Second Son this week. I didn't want to, but somehow, I did. Mainly because, and this is by far my biggest disappointment with it, the story just sort of ends. I was happily tootling along taking over Seattle districts from the DUP, having a ton of fun, thought I'd do an innocuous Story mission, and then whoa! THINGS HAPPEN AND OH BY THE WAY THE END GAME IS NOW NO MORE SIDE ACTIVITIES GO DO THE THING. It was so abrupt, and it's such a shame because up to this point I was loving the slow burn of the story and where it was going, but it just feels like there's a good third of a story missing and they just decided to lift it out hoping no one would notice. I've heard that whilst it's still abrupt, it's handled slightly better in the Evil Karma arc, so It'll be interesting to play through it there, but yeah - that's pretty much my one big blot against a game I've otherwise really, really been enjoying. 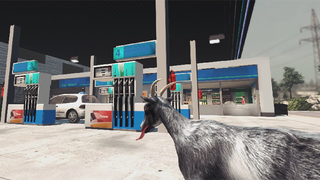 VIDEO GAMES ARE OVER BECAUSE THE RELEASE THAT MATTERS THIS WEEK IS GOAT SIMULATOR 2014. You play as a Goat. Things explode. You get points. It's beautiful. Video games are art, everyone. But there are other things coming out too! Baseball fans get the latest in the Sony-exclusive sports franchise with MLB 14 The Show, out on PS3 and Vita - and speaking of Sony exclusives, there's another for PS3 and Vita in the form of Japanese ARPG Ragnarok Odyssey ACE. There's also, weirdly enough, an up-port of the Arkham handheld spin off game, Batman: Arkham Origins: Blackgate: Delux Edition on PS3, 360, PC and Wii U. They should rename that damn thing the Colon edition. Finally, this Friday sees the release of the long-developed The Elder Scrolls Online, although Early Access for preorders has already started rolling out. Blizzard reveals Blizzard Outcasts: Vengeance of the Vanquished - I love this one, mainly because it pokes fun at Blizzard's early days of developing some pretty turgid fighters, but also because unlike that other Blizzard IP mashup game coming out, this one features some of the company's lower-tier characters (not sure how Kael'thas would feel about dropping that low these days), from Deckard Cain to Arcturus Mengsk, to the one, the only, the Lost Beauty of the Barrens, the Master of Camouflage, the Quillboar's bane: MANKRIK'S WIFE!!! Titanfall gets Optimus Prime as DLC - Now that's a Giant Robot. The only thing that stings about this one that Titanfall isn't actually getting the leader of the Autobots as a replacement for your Titan. Still, I think I'd prefer Metroplex as my Titan - can you imagine dropping him in, with a cry of 'METROPLEX HEEDS THE CALL OF THE LAST PILOT'? Tim Burton is directing The Killzone Movie: A Helghastly Adventure - Another one that's great as a joke until you realise you'd actually want it. That art for the poster is wonderful, and some sort of twisted puppet-animation Killzone short, focusing on the Helghast, would genuinely be incredible. The Prosecutor of Crimea is getting her own Visual Novel - This one is amazing more as a culmination of the internet's bizarre adoration for Natalia Poklonskaya, the recently appointed Prosecutor General for the Crimea. Following her ascension in to the position, her announcement conference went viral in Japan for her alleged 'kawaii-ness' - and also probably because she's an attractive young lady in military uniform - spawning untold amounts of Animé fanart on sites like Pixiv (link may be NSFW). Now, Natalia-Chan is getting her own Visual Novel thanks to J-List: My Girlfriend is the Prosecutor-General.